The first thing you are going to need is Acrobat Reader. It’s 100% free and is the most reliable way for you to open up PDFs and print them. Most printable TN inserts you find will be in the PDF format. If you don’t have a printable insert to follow this tutorial along with, you can grab this month’s freebie for August by subscribing a the bottom of this post. Why is This Not in Order? Now, when you get a Pixel Penguin Press printable you will see you get both Monday and Sunday start folders both with all 4 different colour options inside, for a total of 8 PDFs. Just grab whichever one suits the way you like to plan and open it up with Acrobat Reader. The first thing you will notice is that none of the pages seem to be in order. UGH! But don’t worry, when you get a PDF like this it means that it is set up for booklet printing. It will all sort itself out in the end. 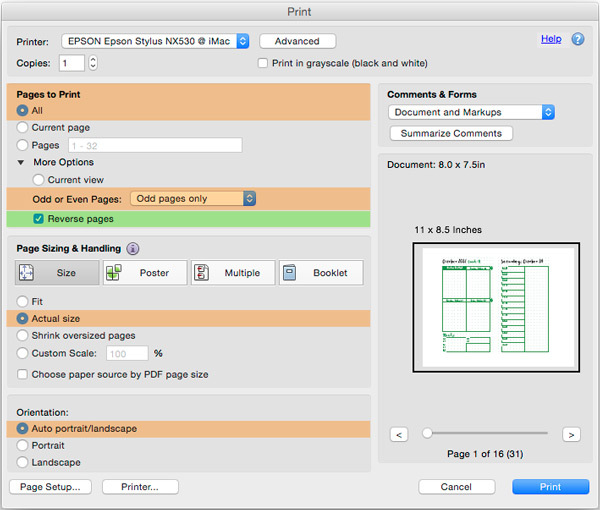 On the other hand, if your pages are all in order, this means your PDF is not set up for booklet printing. You will need to do a little extra leg work to get it work. This is why we give you the easiest possible file to work with so you can avoid that all together. 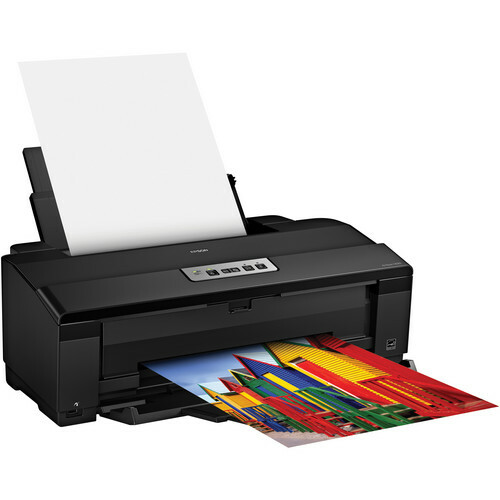 Figure out just how your printer does double sided printing. 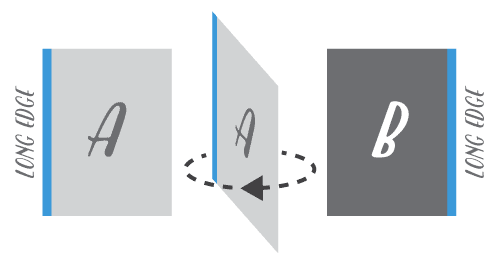 If it does it automatically, ie duplex, you’re golden—just print with that setting on. For the rest of us, we need to reinsert our sheets to print the second side. I highly recommend doing a test print with a couple pages first to make sure you know how the printer will print. Below are the most common settings. 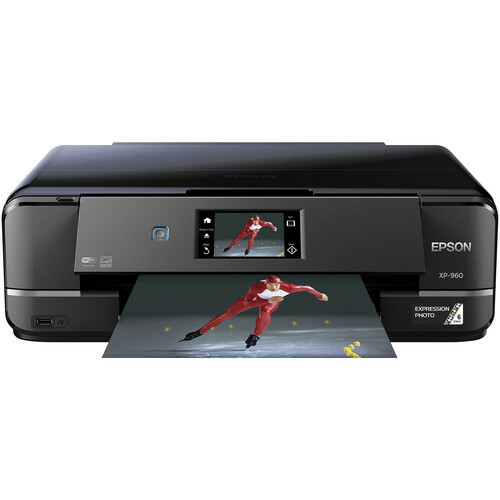 Most home desktop printers are either Top Loading or Bottom Loading. Each has a slightly different process for double sided printing. 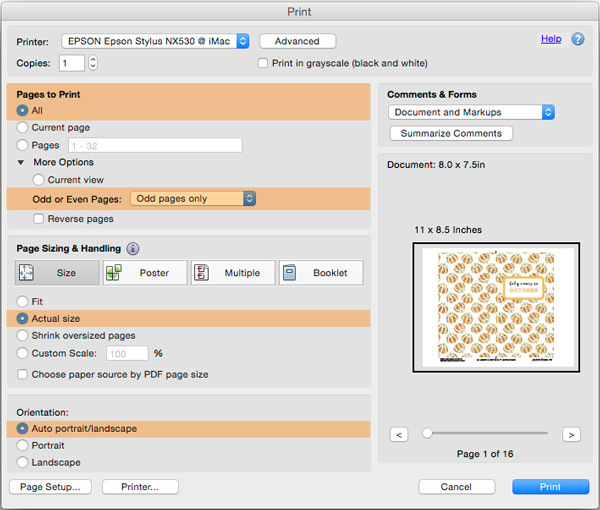 In the Print screen there are just 3 areas you need to pay attention to for correct printing. 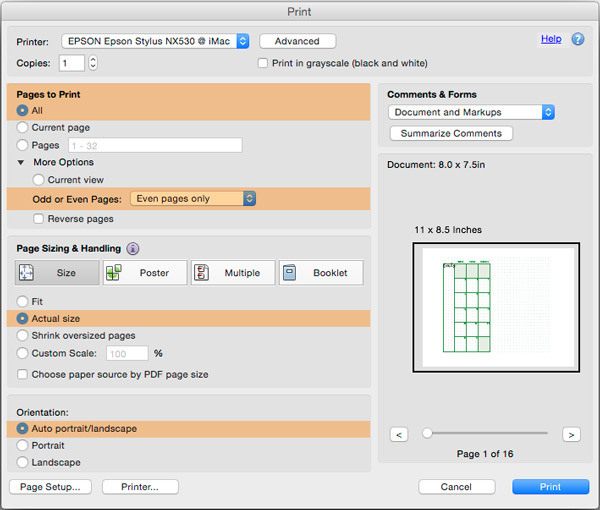 Under Pages to Print, select “All” and for Odd or Even Pages, select “Odd pages only”. Lastly, under Orientation, select “Auto portrait/landscape”. It is important your pages are printed in the very center of your sheet. When it comes to double sided printing it can be mess if they aren’t. Once all your odd pages are printed, you need to flip your pages to print on their back sides. Flip your sheets long edge to long edge (long side over to long side). In your Print screen this time, make sure all of your settings are the same as the first time around, but this time under Odd or Even Pages, I want you to select “Even pages only”. Like the top loading printer setup, there are 3 areas you need to pay special attention to with one key difference. *Also under Pages to Print, I want you to select “Reverse pages” to change their order. ‍Lastly, under Orientation, select “Auto portrait/landscape”. It is important your pages are printed in the very center of your sheet. When it comes to double sided printing it can be mess if they aren’t. Once your pages are printed out, you will NOT need to do any flipping to print on the other side. Just take this stack, exactly as is, and put it back into your bottom tray. This go around, leave “Reverse pages” unchecked. We want it to print in forwards order. If all went well, you should now have a stack of paper where the order follows Sheet 1/Side 1 = Page 1, Sheet 1/Side 2 = Page 2, and so on, matching the PDF. You’re ready to cut! With Pixel Penguin Press inserts there is an included template. To make your life a bit easier, I recommend printing it off and trimming it first. For a nicer, flatter booklet, I recommend separately(or two at a time) folding all of your sheets of paper before cutting. Follow the fold guidelines on the sheet, otherwise in most cases a simple fold in half is all you need to do. When you fold a relatively thick stack of paper you’ll see that the open edge results in a point. There is extra paper that sticks out and is not nice and clean. That is called creep. It happens because papers on the top of the stack are being pushed outwards by the paper on the bottom. *Thicker papers will have larger creep. 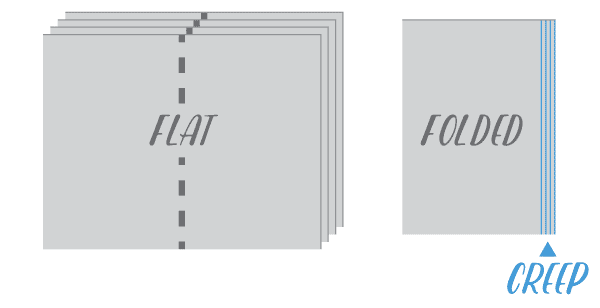 To avoid trimming off information inside, you can make your booklet a few mm larger by adjusting your final cut. Depending on your preferences for creep, there are two ways for you to trim your booklet. On every sheet there are crop marks in all four corners to guide your cuts. I find it best to cut your top and then both sides first. From there, use the template you prepared and line it up with the 3 sides you just cut. This will guide your final cut. For this method, I recommend keeping your sheets in one stack and cutting all of them at once. This is especially important when it comes to cutting off your edge with creep. First cut off your top and bottom edges by using the crop marks provided. Secondly, fold your booklet together. If you are using the window method of cutting and your crop marks are still attached, use them to trim off your final edge. 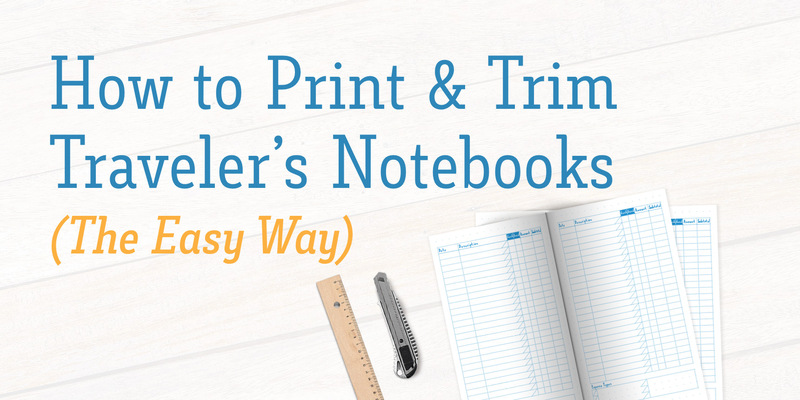 If you’ve cut off all the crop marks, take your pre-cut template, fold it in half, and put it against the folded edge of your traveler’s notebook. This will tell you where your final cut needs to be. Congratulations—your shiny new planner is ready to be stapled, stitched or left as is (your notebook cover elastic should hold things together). The Freebie — The Personal Size Traveler's Notebook for August. We'd love for you to get a test drive of our inserts. 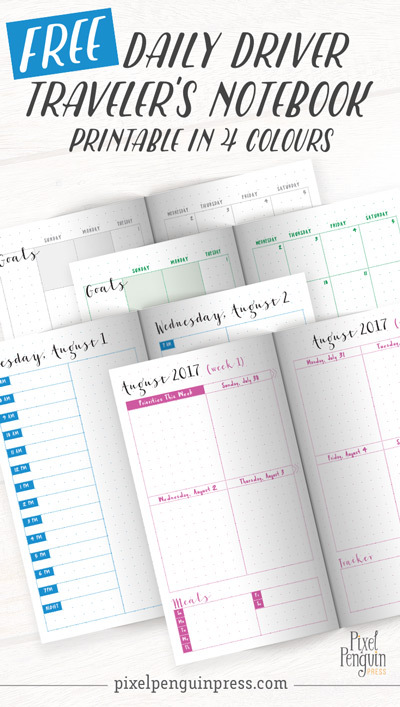 As with all of our monthly planners, it comes with weeks on two pages, days on one page, and a monthly overview with 4 included colours. Even if August has passed, feel free to grab it by subscribing below so you can follow along with the tutorial. For current months, budget trackers, daily layouts and more TN inserts, please visit our shop, pixelpenguinpress.etsy.com.